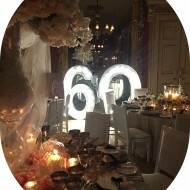 Big birthdays are the big thing in the events world right now. Whether you are 21 or 65 a birthday is always a great excuse for a party – bringing friends and family together to have fun, catch up and celebrate. It’s an occasion you will always want to remember so why not hire our giant lights for a fantastic talking point. They look amazing in any venue or location and can even be used in a marquee. As well as looking stunning they are also a fantastic prop for memorable photos and, at 5ft high, customers can even sit in or on the letters for a photo you’ll never forget! Our numbers are also great for a wedding anniversary party too. Make sure that no one forgets who the birthday girl or boy is by having their name in lights! It’s your big day and imagine celebrating by seeing your name in lights – wouldn’t that be wonderful? We can create any name or combinations that you like from just £98 per letter. Seeing your name sparkling away feels amazing and we will make sure that you have a birthday to remember. Our giant letters can also help complement your party theme. They work really well with a glamorous Hollywood style them or a relaxed vintage event. We can spell out any word you like and FUN, PARTY and GLITZ are our most popular combinations. But of course we can make the words as unique as you are so just ask us for the word that you want and we will get back to you straight away with a tailor made quote!